As acupuncture fertility specialists, we focus on the underlying causes. We have been researching and working with fertility since 2000, and are thrilled to have been a part in helping so many couples to have beautiful children. 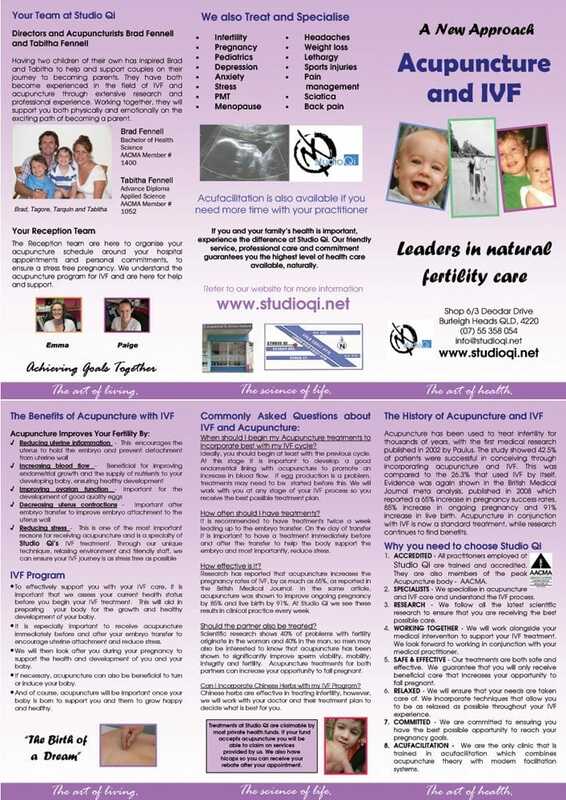 Helping couples to fall pregnant is a passion of ours at Studio Qi and an area that we continue to specialise in. We have been treating couples undergoing IVF with acupuncture since our early years in practice, and are proud today to also treat those babies and children that we had a place in helping to bring into the world. According to acupuncture and Traditional Chinese Medicine theory, there are a number of factors involved in female infertility. Similarly to male infertility, the Kidneys play a major role in storing the genetic essence that is required to conceive a child. Your Kidneys are also responsible for your sexual energy and the maternal warmth required to support a baby in the uterus during a pregnancy. Healthy liver and heart function are also important for successful conception. The Heart is affected by all emotions and is responsible for the circulation of blood through the vessels and the uterus. It has a critical role in encouraging ovulation. Along with the Liver, the Heart is also responsible for a peaceful night's sleep, an important aspect of fertiltiy and general health and wellbeing. The Liver ensures that energy and blood flows healthily through the body to nourish all the organs, especially those involved with conception. The Liver is also important in regulating the hormones required to fall pregnant and reduce the chance of miscarriage. There are certain acupuncture points which are known to stimulate the pituitary gland and encourage the release of fertility hormones. We will spend time with you in your initial consultation to diagnose and understand the reasons for you not falling pregnant. We will then design a treatment plan uniquely for you. As well as your acupuncture treatment, we will also include dietary and lifestyle changes that while being simple to implement can make a very real difference. If you need more information about acupuncture and how it can help you with fertility, please feel free to contact us by email or by phone (07) 5535 8054. We look forward to helping you achieve your fertility goal.